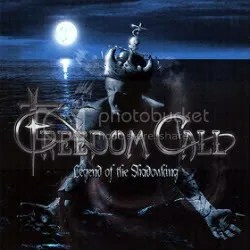 Freedom Call is a German power metal band (with a name like that, I thought they’d be American) that I’m not familiar with at all but somehow I came across their MySpace page and the song “A Perfect Day” and loved it. Since I’m not a big fan of the current form of power metal, I still wasn’t sold yet but I came across this album at FYE for $9.99 and decided to grab it. I took me a few spins to get into the album, but overall it’s pretty good. Chris Bay has a very good voice that soars but that’s usually a given in power metal outfits. Some of the songs are the typically silly and cheesy power metal fare but other moments like “Under the Spell of the Moon”, “Dark Obsession”, “The Darkness” (all three of those are very moody and very cool) and “A Perfect Day” are absolutely excellent. Not surprisingly, the band reminds me of Helloween and Edguy. If I had ever given more than a very brief listen to Gamma Ray, I’m sure I could say they sound like them too since Dan Zimmermann is in that band as well! I’m not even a major power metal fan but if you’re into the current crop of European power metal, this album is a no brainer. There’s a bit of filler here, but it’s worth wading through for the really good stuff.